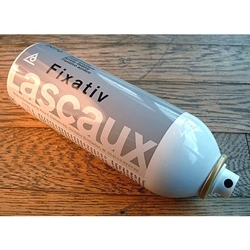 Lascaux Fixative for Pastel, Charcoal & Graphite - Imported from Switzerland, this is the finest pastel fixative we have ever found. Not every pastelist uses a fixative, but those that do will appreciate this brand. It is very transparent, non-yellowing and resistant to aging. 300ml aerosol can.